[Tomato Dirt] What Containers Should You Choose for Growing Tomatoes in Pots? Feature: What Container Should You Choose for Growing Tomatoes in Pots? Choose large containers -- 5 gallons or more, if you can. A common mistake is to select a pot that is too small for the tomato variety. Tomatoes have extensive root systems. When they get root-bound, they produce fewer fruit. The larger type of tomato you grow, the larger the pot you should choose. Choose containers with drainage holes. Tomatoes in pots (like other homegrown crops) need good drainage. 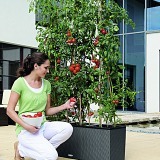 Otherwise, water will pool in the container and roots will rot, killing the plant and all its tomatoes along with it. Make sure that your container or pot has drainage holes in the bottom. Then, if you over-water the excess will seep out the bottom of the pot. Consider different container materials. Terra cotta, clay, plastic, wood, concrete, fiberglass, cast iron, metal – each kind of material has advantages. Be sure to read about the benefits of different containers so you can choose the one that works for your situation. 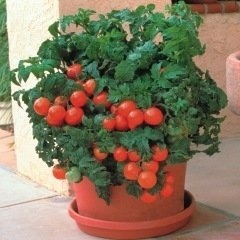 Get more info about choosing containers for tomatoes so you can have healthy, productive tomatoes in pots this season. And check out all kinds of ideas for container tomatoes on our Container Tomatoes Pinterest board. 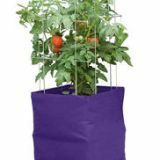 Tomato grow bags are becoming an increasingly popular alternative. Make sure to select higher-quality grow bags like those offered by Gardener’s Supply . They made of felt-like double-layer polypropylene that breathes well and is resilient enough to last several seasons. 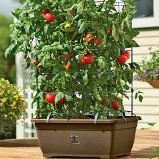 Get more fun and helpful idea for growing tomatoes in pots on our Container Tomatoes Pinterest board.